Let's face it. Fall is the season for knitting. And if you're a nerd like me, you thrill to the signs of approaching fall. The cheap summer goods are gone from the stores, replaced by crisp tidy stacks of paper, pens, and paintboxes. We go back to school, and best of all, we get down to fall knitting. So how perfect is this? 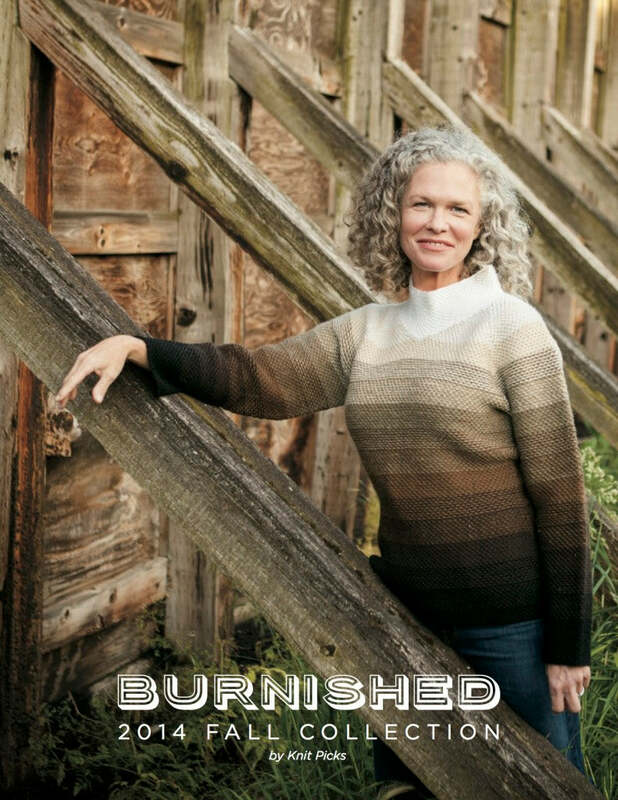 Knit Picks just released a gorgeous new book called Burnished. Doesn't that sound tasty? 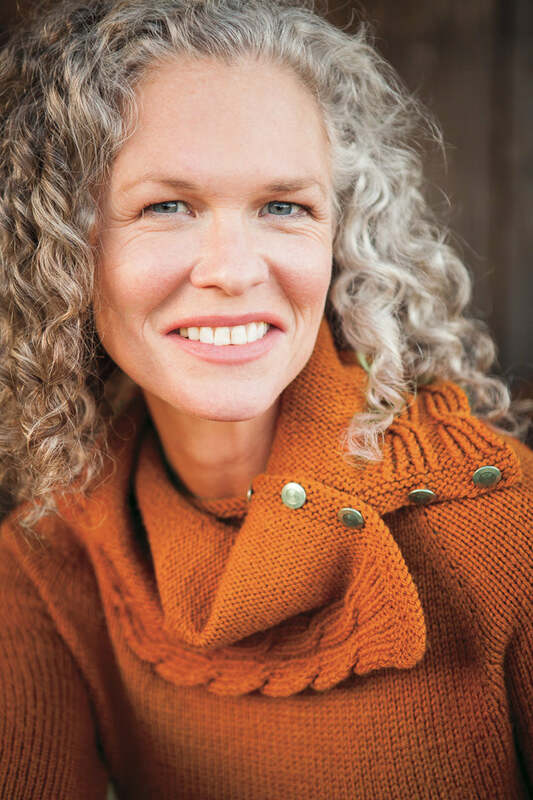 Burnished features 16 new patterns to tickle the knitter's fancy, with cables, colour work, texture, warm collars, cosy cardigans and satisfying accessories. Check it out on Ravelry, the photography is mouth watering! Giant gold stars to Knit Picks on this one; what a fantastic product. I'm going through the 113 pages of Burnished, and wow, the models, the colours, the images, the layout are all lovely. 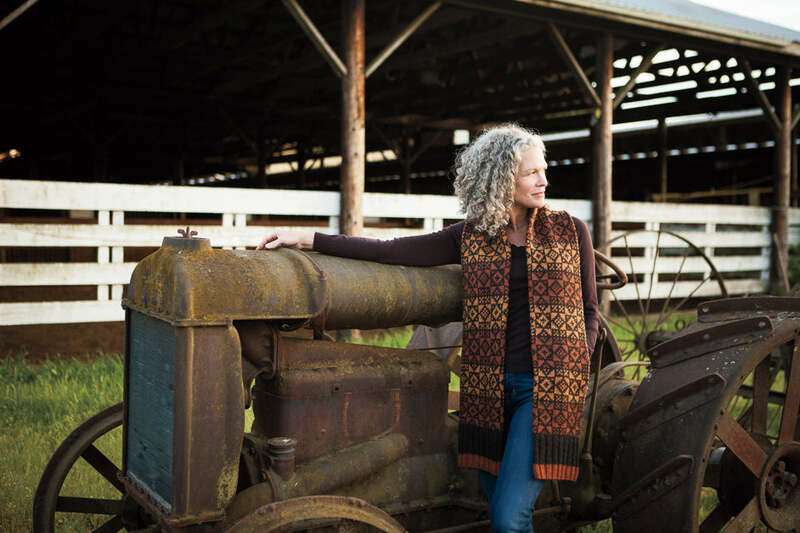 And combined with Knit Picks yarn, which balances luxury, affordability, and practicality (ooh, there's another one of those trifectas I'm so keen on), you can get your teeth into this collection. Here's the cover of Burnished. 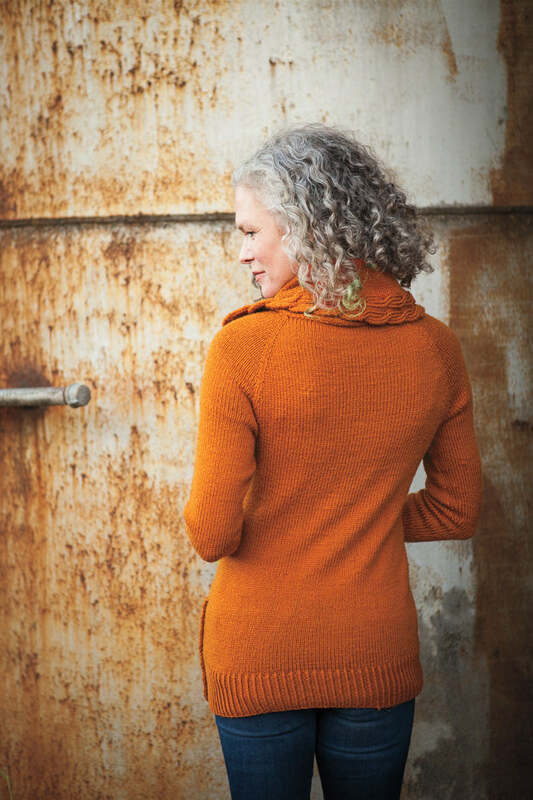 This sweater design is Umbra & Penumbra by Jennifer Thompson. Lovely gradient effect with slipstitch work. My two designs are the Chalet Scarf and the Cartier Cowl Neck Sweater. First, Chalet. I wanted to play more with the stranded colour work chart I did in the Idiot's Guide to Knitting. 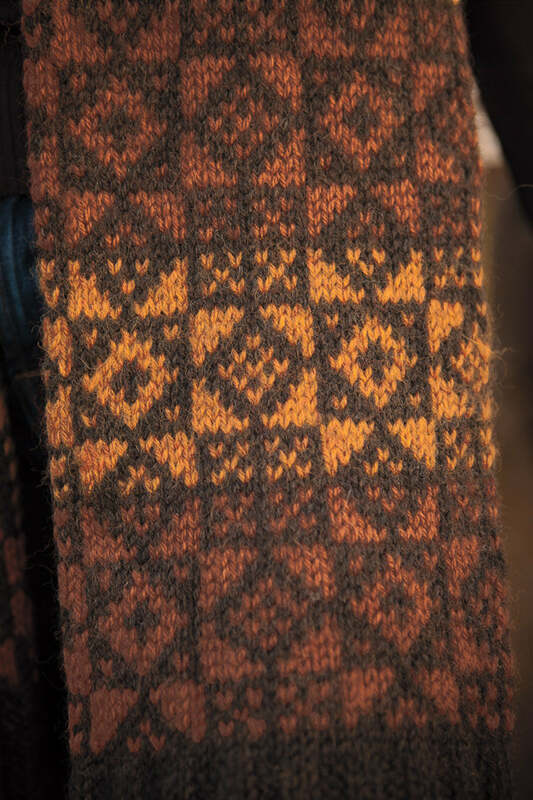 A quilt-like arrangement of squares and triangles with a Scandinavian flavour, this motif is easier to knit than it looks. The floats are kept short, the pattern has a logic to it, and the drama comes in choosing some really tasty colours. I love it in this warm earthy combo of Wool of the Andes Bittersweet Heather, Persimmon, and Brown Sugar. Delicious. Don't you love this model?? Second, Cartier. Another chance to play with a texture from the Idiot's Guide. 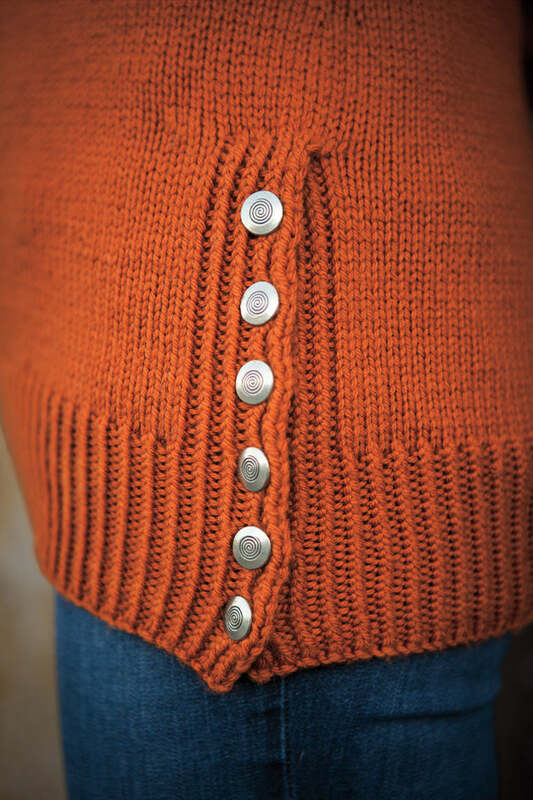 A twisted rib cable looks like advanced knitting, but actually is quite achievable. And I found that a little goes a long way. The construction is fun on this one. You knit the cowl collar edge to edge, flat, with a little short row shaping to give it extra width around the edge and help it fold nicely. Then the body is picked up and worked seamlessly from the top down. The twisted rib at the cuffs and bottom complements the collar. Buttons at the side give it a sophisticated finish. I love how this turns out. I'm working on one for me in Swish DK Squirrel Heather (my favourite Swish colour), and it's almost done.